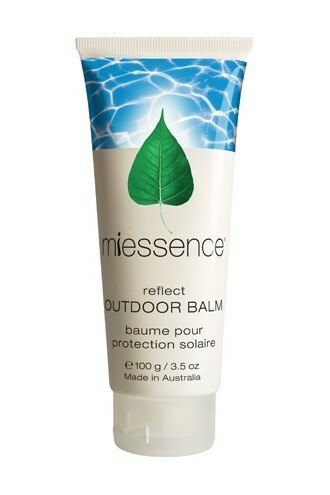 Miessence Reflect Oudoor Balm SPF15 (100g) is a water-free nourishing balm with natural minerals that helps to reflect damaging ultraviolet radiation. Microfine zinc oxide helps offer protection from harmful rays whilst Organic olive oil keeps the skin supple. Potent antioxidants including natural vitamin E, beta carotene and polygonum extract, protect the skin from signs of damage caused by the elements. Use any time you are exposed to the elements. For those who love the outdoors – Few this make us feel more alive than having fun in the elements. Whether it is pounding through the salty surf, swooshing down powdery ski runs, or just playing with our kids in the park; if you’re out in the sunshine, you need to protect your skin. Zinc oxide is the mineral used in Reflect. It has over a 300 year history of safety with no known adverse reactions (which is why it is often used to treat babies). It protects against UVB and most of the UVA spectrum and is the closest thing to a total sunblock on the market today. No other sunscreen ingredient provides broader protection (1). (1) Excerpt from: Dr. Pinnell, The J. Lamar Callaway Professor of Dermatology at Duke University Medical Center, Durham, NC, is a consultant for sunSmart, Wainscott, NY, and SkinCeuticals, Dallas, TX. Dr. Madey is the medical/scientific liaison for SkinCeuticals, Dallas TX. Organic olea europae (olive) fruit oil, zinc oxide, organic butyrospermum parkii (shea) fruit butter, organic unrefined cera alba (beeswax), mixed tocopherols (natural vitamin E), organic copernicia prunifera (carnauba) wax, natural coconut extract, proprietary blend of essential oils, organic simmondsia chinensis (jojoba) seed oil, organic rosmarinus officinalis (rosemary) CO2 extract, daucus carota (carrot) CO2 seed extract.